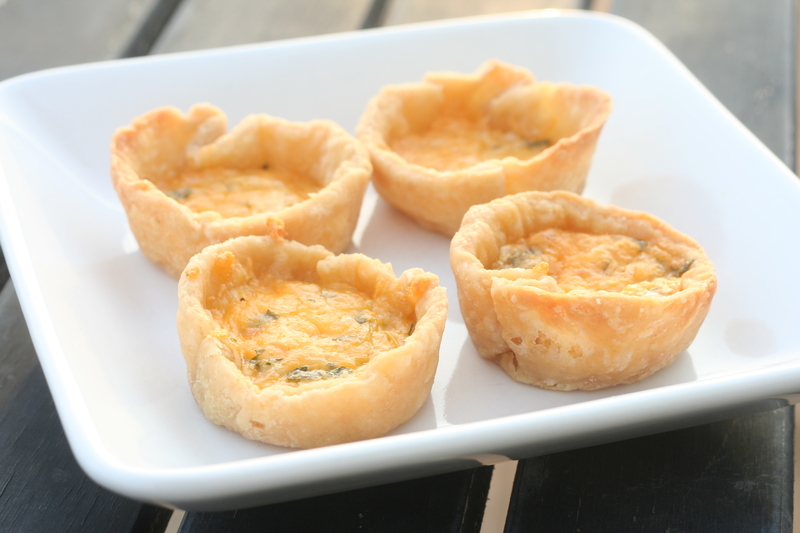 These savory pastries would be perfect for brunch or a snack or a dinner or any time. They are seriously delicious! They were a hit with children and adults alike. The buttery, flaky crust with the creamy cheese filling was pretty much perfect. I'm think these may be added to the Easter brunch menu this year. Place flour, salt, cream of tartar, and butter in a food processor, Blend until texture is coarse and add water. Blend just until the mixture is combined and begins to mass together (add more water if needed). Place on plastic wrap, flatten to disk and wrap airtight. Refrigerate for at least 1 hour. Roll dough on floured surface to 1/8 inch thickness. Cut out 24 circles with 3 inch water glass or biscuit cutter. Pleat edges of circles and fit in bottom of muffin tins. Preheat oven to 425 degrees. Beat egg in bowl. Add remaining ingredients. Spoon 2-3 tsp. filling in each pastry shell; spread level. Bake in preheated oven for 12-15 minutes or until the filling is golden brown. Cool on rack and serve warm. *These could be made ahead, refrigerated and warmed in the oven.